The Planning and Land Use Committee of the L.A. City Council on Tuesday will consider whether to designate the Lytton Savings building a historic cultural monument. 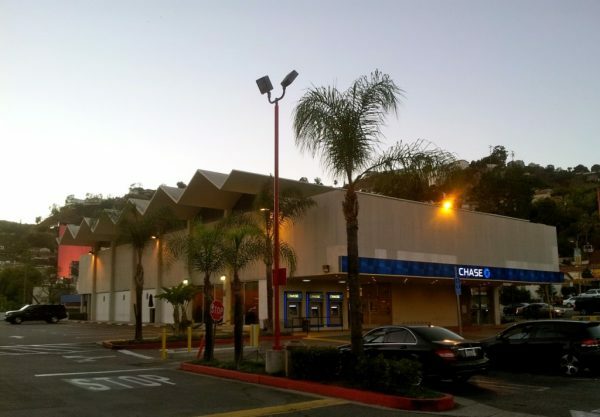 The Lytton Savings Building is in a shopping plaza at 8150 Sunset Boulevard at the intersection with Crescent Heights. That is the location of a controversial project by Townscape Partners that won the approval of the L.A. City Council on Nov 1. In mid-September the L.A. Cultural Heritage Commission unanimously agreed to grant landmark status to the Lytton Savings building, which was designed by noted Southern California architect Kurt Meyer. Now a Chase Bank, the building with its zig zag folded plate roof, glass walls and interior art work offered a radical architectural departure from traditional bank building when it opened in 1960. If the PLUM committee were to agree to the historic cultural designation, that decision would have to be ratified by the entire L.A. City Council. Preservationists had pushed to have Townscape integrate the Lytton Savings building into plans for their project. However, Frank Gehry, whose architectural firm is designing the project, has said that the bank building occupies a space where a construction crane must be placed. The 8150 Sunset project calls for 229 residential units of mostly apartments and 65,000 square feet of commercial space, with plans for a grocery store, restaurants and retail shops. It sits on the northern border of West Hollywood and has sparked complaints from WeHo residents of possible heavy traffic on residential streets, large shadows from its tall buildings across their neighborhood and overuse of the sewer system in West Hollywood. On Oct. 25 the PLUM committee voted in support of the 8150 Sunset project that calls for the demolition of this Mid-Century modern gem. L.A. City Councilmember David Ryu, in whose district the project sits, negotiated a reduction of its tallest building, originally set at 234 feet, to 178 feet. The City of West Hollywood, which opposed the project and had threatened to file a lawsuit against it, sent a team to the Oct. 25 PLUM meeting consisting of Mayor Lauren Meister, Community Development Director Stephanie DeWolfe and attorney Beth Collins-Burgard to also negotiate a deal with Townscape. Meister and Councilmember Lindsey Horvath had been named to a city council subcommittee to negotiate a deal with Townscape. Townscape agreed to WeHo’s request to increase the project’s distance from West Hollywood’s northern border by 10 feet and to move mechanical equipment such as air conditioning compressors away from the WeHo border. In addition, Townscape said it will give West Hollywood $2 million for traffic improvements and $500,000 for sewer improvements. In exchange, the City of West Hollywood dropped its opposition to the project. Meister also said that WeHo would construct bollards on Havenhurst Drive, which is on the eastern border of the construction site, to block traffic related to the project from streaming up and down that residential street to Sunset Boulevard. But other issues emerged later. Meister discovered after the agreement that an exit planned from the 8150 Sunset site would enter Havenhurst inside the border of West Hollywood, raising questions about whether the city could interrupt traffic flow with the proposed bollards, which had to be installed within the city’s boundaries. West Hollywood pressed Townscape to make sure the driveway onto Havenhurst would be north of the traffic bollard. Also Horvath, a member of the WeHo City Council negotiation subcommittee, said she hadn’t been consulted about the deal. Horvath said she learned of it in a text message from an L.A. City Council member during the PLUM meeting. The West Hollywood City Council held a private “emergency” meeting on Nov. 5 to formally approve the Townscape settlement, which it did in a 3-to-2 vote. Councilmembers John Duran, John Heilman and Lindsey Horvath voted for the settlement. Mayor Meister and Councilmember John D’Amico opposed it. Duran and Heilman’s past election campaigns have been major recipients of money from Townscape Partners and its owners. The PLUM meeting will take place at 2:30 p.m. Tuesday at the Board of Public Works Room 350, 200 N. Spring St. in downtown Los Angeles. This place is such a dump – Garden of Allah should never have been replaced with this dump. Let the wrecking ball swing! Has any city official reviewed the proposed constitution plans???. The crane would not on the Lytton location. Ironic, considering this rather ordinary building replaced the beautiful–and genuinely historic– Garden of Allah in the first place. Where was the outrage then?